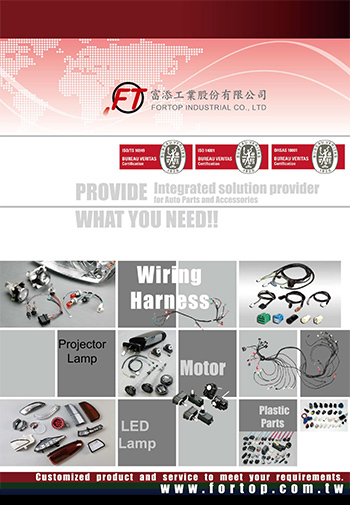 FORTOP was founded in 1994 by Mr. Lin and based in Tainan, Taiwan. We have rich experiences in OEM/ODM for more than 2 decades. Our products divided into two parts, wiring harness and lighting system. The wiring harness has been our core business since 1994.FORTOP designs and manufactures the highest quality and most reliable wiring harness products for the automotive and motorcycle industry. A wiring harness is an organized set of wires, terminals and connectors that run throughout the entire vehicle and relay information and electric power, thereby playing a critical role in “connecting” a variety of components. We have three own plants to offer sufficient components supply chain. based on rich experiences in customizing wiring harness and lamps, FORTOP is confident to go one step further in developing durable wiring harness and powerful lighting system to meet customer requirement. We have our own factories to offer sufficient components supply chain. We have Mould design and development capability. With completely inspection facilities and strict QC managements to offer qualified products. Mission: Offer excellent products & service to be the World's leading brand. Ideal: The whole society can enjoy a happy life and have a healthy and happy life . 2. To strengthen the intelligence, the technique and the production. 3. To meet the market demand and pay attention to the environmental safety. 4. To keep enhancing the enterprise competitiveness and to achieve the expectation of high quality, low cost and short delivery.